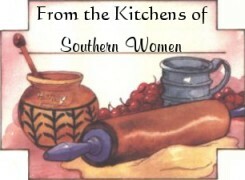 Nothin' better than Good Southern Cooking!!! on to share a great recipe or two! Visit their homepages and say "Thanks" for sharing ! Looking forward to next month's recipes!! Ladies please accept this emblem as our token of Thanks!! for your contribution!! Let's keep the tradition going!! Spread in a 9x9 cake pan or round pie pan. Sprinkle with 1/2 C. chopped nuts (walnuts or pecans). until boiling, stirring, reduce heat to medium and boil for 3 minutes. Pour sauce over cake mixture. Bake at 350 degrees F for 35 minutes. Serves approx. 8-9, best when cooled for at least an hour. Serve the cake pudding side up and with milk. Store uneaten portion in refrigerator. Best if eaten within a few days. Not that there is usually a problem with that. cheese and red peppers. Add parsely. Heat through, eat. Cook celery, onion and green pepper in butter till tender. Remove. Fry chicken pieces in shortening in a heavy skillet till brown. Mix undrained tomatoes, and all the rest of the ingredients, bring to boiling, reduce heat. Replace the chicken, cook till rice is tender. Discard the bay leaf, if desired. Serves 6. In a sauce pan heat 3/4c of 7up; bring to a boil. Add Lime Jello, stir well until completely dissolved & set aside. In a mixing bowl, cream the cream cheese with 2Tbsp water. Slowly add 7up mixture & beat until smooth. Add crushed pineapple & nuts. Pour mixture into a mold or serving bowl and refriderate 2-3 hours until congealed. **note** I put this in small individual molds, the kids love it!